Why more families are dedicating space to playing together (and with their friends). 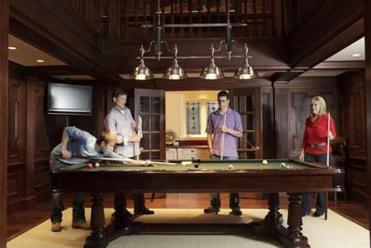 TAKING THEIR CUES The Renner family’s home in Weston has a mahogany-clad billiard room, designed by Foley Fiore, situated in the heart of the house. Gone are the days when pool, Ping-Pong, dartboards, and the like were afterthoughts, relegated to an unfinished basement or stuck in an extra, unloved room. Even as designers have re-branded subterranean space as the “lower level,” families are moving entertainment areas upstairs. Billiard rooms are appearing in the heart of the house. Homeowners are clearing cobwebs from attics and asking architects to cut skylights and contractors to retrofit HVAC systems to create light-filled aeries to house foosball and flat screens. And even when game areas are located in the basement, interior designers work to ensure homeowners don’t feel as though they’re underground. Maggie Booz, principal of Smart Architecture in Cambridge, asserts that a successful game room is a place where people want to spend time regardless of its paraphernalia. 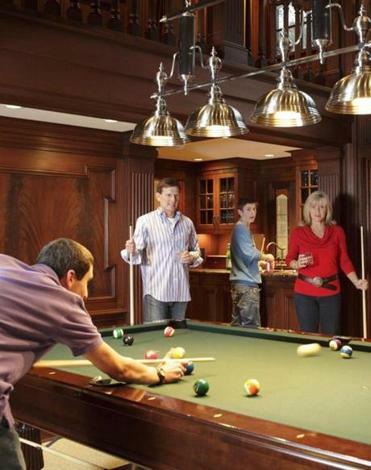 By contrast, if it’s constricted or cold, once the initial excitement of having a pool table or arcade game wears off, nobody is going to want to hang out there. In a lower-level Brookline game room designed by Andra Birkerts, a Mylar ceiling reflects color and brightens the space. Sometimes a space simply lends itself to the task. When Tom Huth, principal of Cambridge firm Thomas R. Huth Architects, considered the unused attic of a client’s home in the Brattle Street area of Cambridge, he suggested transforming the area into a game room. Spacious, sunny, and architecturally interesting, it’s become a hub of family activity, with a pool table, foosball, Pac-Man machine, huge TV area, and even a separate exercise room and media room. The family also has a more casual game room above the garage, with foosball, air hockey, a pinball machine, a table for poker and board games, and multiple screens for video games. While some tuck away this sort of asylum, the Renners were careful to locate theirs so they can get to it through the most-used entry in the house. “From the kitchen, I can see who’s coming and going, which is important when you have teenagers,” Kelly says. The home’s outdoor sport court, rigged with music and lighting, and the adjacent patio, complete with fire pit, are easily accessible from the garage game room. Gone are the days when pool, Ping-Pong, dartboards, and the like are afterthoughts, relegated to an unfinished basement or stuck in an extra, unloved room. Families are rethinking where to locate — and how to outfit — entertainment areas, with delightful results. Watertown-based interior designer Urit Chaimovitz planned a game room for clients in Needham “that would appeal to their growing kids,” as well as friends of all ages. Ample space was needed to accommodate a pool table, pinball machine, jukebox, basketball hoop, drum set, and kitchenette. To make sure everyone liked the layout, Chaimovitz made templates of all the elements, laid them down in the room, and had the family walk around the pool table’s outline with cues in hand. Pool tables, which come in various sizes, require 4½ feet of clearance on all sides to allow enough room for the standard 48-inch cue. Chaimovitz says she keeps basement spaces from looking drab by choosing finishes that are equal in quality to those in the main level. In the Needham home, she had wood floors installed. 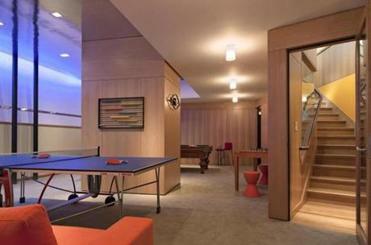 For a contemporary vibe, the pool table was covered in a camel-colored felt. Instead of window treatments, which can look silly on tiny basement windows, she commissioned stained-glass artist Cathryn Blackwell to create inserts to pop over them. For the lower-level game room of a Brookline home, Alan Joslin, principal of Cambridge-based Epstein Joslin Architects, designed a sophisticated, programmable lighting system that changes colors. Wellesley’s Andra Birkerts, who designed the interior, covered the ceiling in Mylar, which reflects color into the room, further brightening the space and enhancing its playful feel.